After catching the start of yesterday’s Centre for Environment Research Day, I headed around the corner to catch the talk by Ray Pierrehumbert on “Climate Ethics, Climate Justice“. Ray is here all week giving the 2010 Noble lectures, “New Worlds, New Climates“. His theme for the series is the new perspectives we get about Earth’s climate from the discovery of hundreds of new planets orbiting nearby stars, advances in knowledge about solar system planets, and advances in our knowledge of the early evolution of Earth, especially new insights into the snowball earth. I missed the rest of the series, but made it today, and I’m glad I did, because the talk was phenomenal. Ray began by pointing out that climate ethics might not seem to fit with the theme of the rest of the series, but it does, because future climate change will, in effect, make the earth into a different planet. And the scary thing is we don’t know too much about what that planet will be like. Which then brings us to questions of responsibility, particularly the question of how much we should be spending to avoid this. Figure 1 from Rockstrom et al, Nature 461, 472-475 (24 Sept 2009). Original caption: The inner green shading represents the proposed safe operating space for nine planetary systems. The red wedges represent an estimate of the current position for each variable. The boundaries in three systems (rate of biodiversity loss, climate change and human interference with the nitrogen cycle), have already been exceeded. Humans are a form of life, and are altering the climate in a major way. Some people talk about humans now having an impact of “geological proportions” on the planet. But in fact, we’re a force of far greater than geological proportions: we’re releasing around 20 times as much carbon per year than what nature can do (for example via volcanoes). We may cause a major catastrophe. 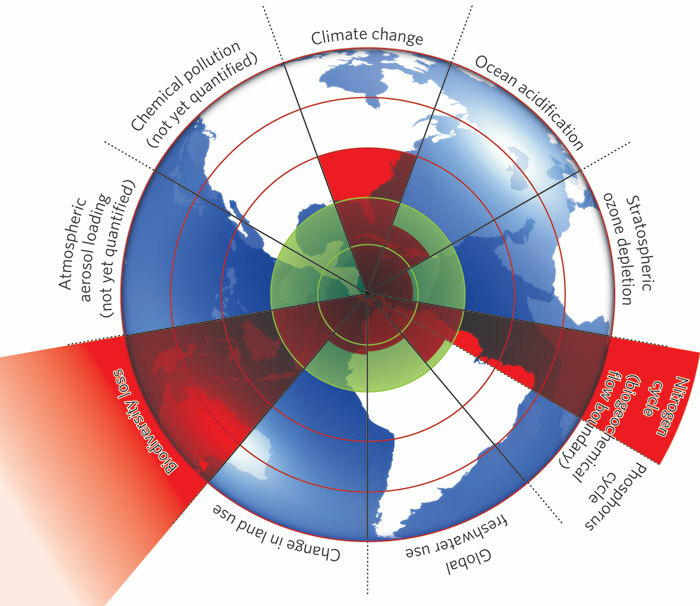 And we need to consider not just CO2, but many other planetary boundaries – all biogeochemical boundaries. But this is nothing new – this is what life does – it alters the planet. The mother of all planet altering lifeforms is blue-green algae. It radically changed atmospheric chemistry, even affecting composition of rocks. If the IPCC had been around at the end of the Archean Eon (2500 million years ago) to consider how much photosynthesis should be allowed, it would have been a much bigger question than we face today. The biosphere (eventually!) recovers from such catastrophes. There are plenty of examples: oxygenation by cyanobacteria, snowball earth, permo-triassic mass extinction (90% of species died out) and the KT dinosaur killer astreroid (although the latter wasn’t biogeochemically driven). So the earth does just fine in the long run, and such catastrophes often cause interesting things to happen, eg. opening up new niches for new species to evolve (e.g. humans!). But normally these changes take tens of millions of years, and whichever species were at the top of the heap before usually lose out: the new kind of planet favours new kinds of species. So what is new with the current situation? Most importantly we have foresight and we know about what we’re doing to the planet. This means we have to decide what kind of climate the planet will have, and we can’t avoid that decision, because even deciding to do nothing about it is a decision. We cannot escape the responsibility. For example, we currently have a climate that humans evolved to exist in. The conservative thing is to decide not to rock the boat – to keep the climate we evolved in. On the other hand we could decide a different climate would be preferable, and work towards it – e.g. would things be better (on balance) if the world were a little warmer or a little cooler. So we have to decide how much warming is tolerable. And we must consider irreversible decisions – e.g. preserving irreplaceable treasures (e.g. species that will go extinct). Or we could put the human species at the centre of the issue, and observe that (as far as we know) the human specifies is unique as the only intelligent life in the universe; the welfare of the human species might be paramount. So then the question then becomes: how should we preserve a world worth living in for humanity? So far, we’re not doing any better than cyanobacteria. We consume resources and reproduce until everything is filled up and used up. Okay, we have a few successes, for example in controlling acid rain and CFCs. But on balance, we don’t do much better than the bacteria. Consider carbon accounting. You can buy carbon credits, sometimes expressed in terms of tonnes of CO2, sometimes in terms of tonnes of carbon. From a physics point of view, it’s much easier to think in terms of carbon molecules, because it’s the carbon in various forms that matters – e.g. dissolved in the ocean making them more acidic, in CO2 in the atmosphere, etc. We’re digging up this carbon in various forms (coal, oil, gas) and releasing it into the atmosphere. Most of this came from biological sources in the first place, but has been buried over very long (geological) timescales. So, we can do the accounting in terms of billions of tonnes (Gt) of carbon. The pre-industrial atmosphere contained 600Gt carbon. Burning another 600Gt would be enough to double atmospheric concentrations (except that we have to figure out how much stays in the atmosphere, how much is absorbed by the oceans, etc). World cumulative emissions show an exponential growth over last century. We are currently at 300Gt cumulative emissions from fossil fuel. 1000Gt of cumulative emissions is an interesting threshold, because that’s about enough to warm the planet by 2°C (which is the EU’s stated upper limit). A straight projection of the current exponential trend takes us to 5000GtC by 2100. It’s not clear there is enough coal to get us there, but it is dangerous to assume that we’ll run out of resources before this. The worst scenario: we get to 5000GtC, wreck the climate, just as we run out of fossil fuels, so civilization collapses, at a time when we no longer have a tolerable climate to live in. Of course, such exponential growth can never continue indefinitely. To demonstrate the point, Ray showed the video of The Impossible Hamster Club. The key question is whether we will voluntarily stop this growth in carbon emissions, and if we don’t, at what point will natural limits kick in and stop the growth for us? Silicate weathering (reaction between rocks and CO2 in the atmosphere that creates limestone) – a few hundred millenia. Ray then showed the results of some simulations using the Hamburg carbon cycle model. The scenario they used is a ramp up to peak emissions in 2010, followed by a drop to either 4, 2, or 1Gt per year from then on. The graph of atmospheric concentrations out to the year 4000 shows that holding emissions stable at 2Gt/yr still causes concentrations to ramp up to 1000ppm. Even reducing to 1Gt/yr leads to an increase to around 600ppm by the year 4000. The obvious conclusion is that we have to reduce net emissions to approximately zero in order to keep the climate stable over the next few thousand years. What does a cumulative emissions total of 5000GtC mean for our future? Peak atmospheric concentrations will reach over 2000ppm, and stay there for around 10,000 years, then slowly reducing on a longer timescale because of silicate weathering. Global mean temperature rises by around 10°C. Most likely, the greenland and west antarctic ice sheets will melt completely (it’s not clear what it would take to melt the east antarctic). So what we do this century will affect us for tens of thousands of years. Paul Crutzen coined the term anthropocene to label this new era in which humans started altering the climate. In the distant future, the change in the start of the anthropocene will look as dramatic as other geolological shifts – certainly bigger than the change at the end of the KT extinction. This makes geoengineering by changing the earth’s albedo an abomination (Ray mentioned as an example the view put forward in that awful book Superfreakonimics). It’s morally reprehensible, because it leads to the Damocles world. The sword hanging over us is that for the next 10,o000 years, we’re committed to doing the sulphur seeding every two years, and continuing to do so no matter what unforutunate consequence such as drought, etc. happen as side effects. But we will need longwave geoengineering – some way of removing CO2 from the atmosphere to deal with the last gigatonne or so of emissions, because these will be hard to get rid of no matter how big the push to renewable energy sources. That suggests we do need a big research program on air capture techniques. What is the right amount to spend to reduce emissions? How should costs be divided up (e.g. US, Europe, Asia, etc)? How to figure the costs of inaction? When should it be spent? There is often a confusion between fairness and expedience (e.g. Cass Sunstein, an Obama advisor, makes this mistake in his work on climate change justice). The argument goes that a carbon tax that falls primarily on the first world is, in effect, a wealth transfer to the developing world. It’s a form of foreign aid, therefore hard to sell politically to Americans, and therefore unfair. But the real issue is not about what’s expedient, the issue is about the right thing to do. Not all costs can be measured by money, which makes cost-benefit analysis a poor tool for reasoning about climate change. For example, how can we account for loss of life, loss of civil liberties, etc in a cost/benefit analysis? Take for example the effect of capital punishment on crime reduction versus the injustice of executing the innocent. This cannot be a cost/benefit decision, it’s a question of social values. In economic theory the “contingent valuation” of non-market costs and benefits is hopelessly broken. Does it make sense to trade off polar bear extinction against Arctic oil revenue by assigning a monetary value to polar bears? A democratic process must make these value judgements – we cannot push them off to economic analysis in terms of cost-benefits. The problem is that the costs and benefits of planetary scale processes are not additive. Therefore cost/benefit is not a suitable tool for making value decisions. Similarly the use of (growth in) GDP, which is used by economists as a proxy for a nation’s welfare. Bastiat introduced the idea of the broken window fallacy – the idea that damage to people’s property boosts GDP because it increases the need for work to be done to fix it, and hence increases money circulation. This argument is often used by conservatives to poohpooh the idea of green jobs – what’s good for jobs doesnt necessarily make people better off. But right now the entire economy is made out of broken windows: Hummers, Mcmansions, video screens in fastfood joints,… all of it is consumption that boosts GDP without actually improving life for anyone. (Perhaps we should try to measuring gross national happiness instead, like the Bhutanese). Fairness is a major issue. How do we approach this? For example, retributive justice – punish the bad guys? You broke it, you fix it? Whoerever suffers the least from fixing it moves first? Consider everyone to be equal? Well, the Canadian climate policy appears to be: wait to see what Obama does, and do the same, unless we can get away with doing less. What about China vs. the US, the two biggest emitters of greenhouse gases? The graph of annual CO2 emissions shows that China overtook the US in the last few years (while, for example, France held their emissions constant). But you have to normalize the emissions per capita, then the picture looks very different. And here’s an interesting observation: China has a per capita emissions very close to that of France, but doesn’t have French standard of living. Therefore there is clearly room for China to improve its standard of living without increasing per capita emissions, which means that emissions controls do not necessarily hold back development. 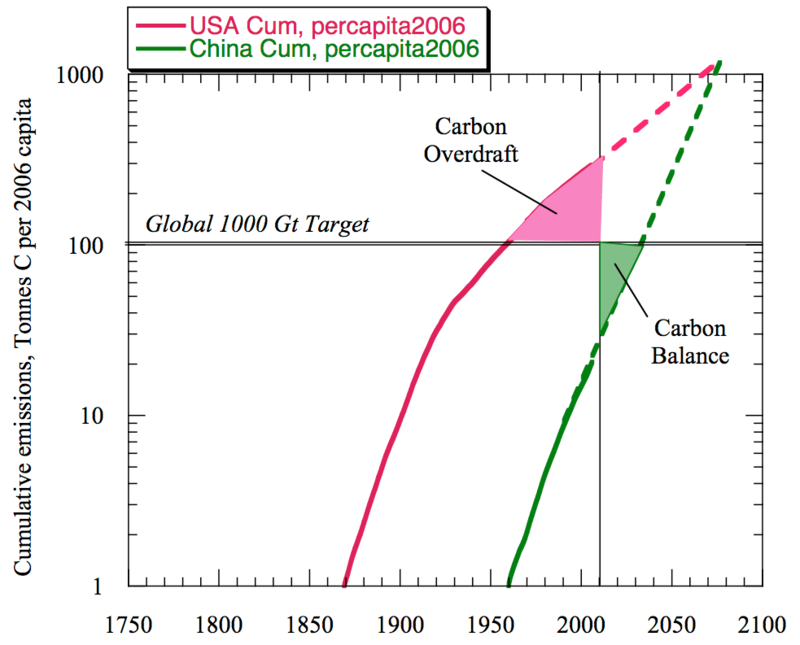 This graph shows the cumulative emissions per (2006) capita for the US and China. If we take 100 tonnes as the lifetime limit for each person (to keep within the global 1000Gt target), then the US has already used more than its fair share, and China has used much less. This analysis makes it clear what the climate justice position is. The Chinese might argue that just to protect themselves and their climate, China might need to do something more than its fair share. In terms of a negotiation, arguing about everyone taking action together, might be expedient. But the right thing to do for the US is not just to reduce emissions to zero immediately, but to pay back that overdraft. Q: On geoengineering – why rule out attempts to change the albedo of the earth by sulphate particle seeding when we might need an “all of the above” approach? A: Ray’s argument is largely about what happens if it fails. For example, if the dutch dykes fail, in the worst case, the Dutch could move elsewhere. If global geoengineering fails, we don’t have an elsewhere to move to. Also, if you stop, you get hit all at once with the accumulated temperature rise. This makes Levitt’s suggestion of “burn it all and geoengineer to balance” to be morally reprehensible. Q: Could you say more about the potential for air capture? A: It’s a very intriguing idea. All the schemes being trialed right now capture carbon in the form of CO2 gas, which would then need to be put down into mineral form somehow. A more interesting approach is to capture CO2 directly in mineral form, e.g. limestone. It’s not obviously crazy, and if it works it would help. It’s more like insurance, and investing in research in this likely to provide a backup plan in a way that albedo alteration does not. Q: What about other ways of altering the albedo? A: Suggestions such as painting roofs & parking lots white will help reduce urban heat, mitigate effect of heatwaves, and also reduce use of airconditioners. Which is good, but it’s essentially a regional effect. The overall effect on the global scale is probably negligible. So it’s a good idea because it only has a regional impact. Q: About nuclear – will we need it? A: Ray says probably yes. If it comes down to a choice between nuclear vs. coal, the choice has to be nuclear. Finally, I should mention Ray has a new book coming out: Principles of Planetary Climate, and is a regular contributor to RealClimate.org.